Jazz Station - Arnaldo DeSouteiro's Blog (Jazz, Bossa & Beyond): CD of the Day - "Quintet of the Americas: Sounds of Brazil"
CD of the Day - "Quintet of the Americas: Sounds of Brazil"
Produced by Barbara Oldham. Engineered by Paul Cox. Recorded January, 2008 in Levenson Recital Hall (Brooklyn College), NY, it's a superb album featuring works by Brazilian composers Gaudencio Thiago de Mello ("Chant No.2 - Uirapurú do Amazonas," "O Canto da Yara," "Canoa Furada," "A Hug for Pixinga," "Varre-Vento" and "Pra Dormir na Rede"), Pixinguinha ("As Proezas de Nolasco"), Ernesto Nazareth ("Brejeiro," "Odeon," "Escorregando," "Apanhei-te Cavaquinho"), Ricardo Romaneiro ("Ventos") and Marcelo Zarvos ("Changes - Sextet for Winds & Piano"). Thiago de Mello (organic percussion), Blair McMillen (piano) & Scott Kuney (guitar) join the five virtuoso members of the Quintet: Sato Moughalain (flute), Matt Sullivan (oboe), Edward Gilmore (clarinet), Laura Koepke (bassoon) & Barbara Oldham (French horn). Arranged by Daniel Wolff, Stephen Quint, Barbara Oldham & Marco Granados. The Quintet of the Americas is one of the Western Hemispheres finest chamber ensembles. The Quintet is in residence in The Department of Music and Performing Arts in The Steinhardt School at New York University. Since its founding in Colombia in 1976, Quintet of the Americas has delighted in performing music of South America. Following its successful recording "Dancing in Colombia," the ensemble is proud to be releasing this CD of music with Brazilian roots. The idea for this disc originated with the Quintet s arrangements of music by Ernesto Nazareth and Pixinguinha. 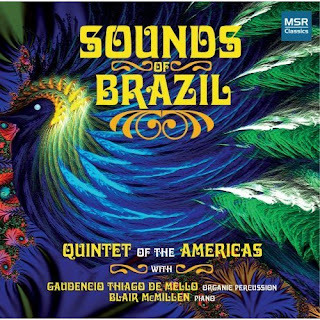 More music from Brazil was added to the Quintet s collection when their long-time friend and inspiration, Brazilian multi-instrumentalist & composer Thiago de Mello, began performing with the Quintet in arrangements of his brilliant songs by Daniel Wolff. Further collaborations with Brazilian pianist and composer Marcelo Zarvos led to the commissioning of "Changes." Rounding out the album is another commissioned work, "Ventos," by the gifted young São Paulo-born (and NY-based) composer, Ricardo Romaneiro. Quintet of the Americas was founded in 1976 in Bogotá, Colombia, by five players from the United States who were the principal wind players of the Orquesta Sinfónica Nacional. Two-time recipients of the ASCAP/Chamber Music America Adventuresome Programming Awards, the Quintet s programs have included repertoire as varied as commissioned pieces involving electronic music, Sephardic music, Native American music, music from the African Diaspora and music influenced by jazz, as well as music involving the Quintet s collection of folk instruments including drums, flutes, rattles, conch horns, etc., and music with theatrical elements such as lighting, masks, and choreography. The Quintet has toured extensively in the United States, and in Canada, Venezuela, Colombia, the Caribbean, Ukraine and the Republic of Georgia. The Quintet is currently in residence in the Department of Music and Performing Arts in the Steinhardt School at New York University. The group's extensive residency experience has included the Chamber Music America Residency Program in Chicago involving Northwestern University, the Chicago Youth Symphony and the People's Music School; Austin Peay State University (Tennessee); and several years at Hunter College (New York) and New York's Americas Society. The group has performed outreach programs for Carnegie Hall Neighborhood Concerts, Lincoln Center, Chamber Music Society of Lincoln Center, 92nd Street Y, Midori and Friends, Fondacion Batuta in Colombia, Queens Symphony, and Young Audiences. In 2002, the Quintet gave master classes and concerts for the Special Secondary Music School in Kharkiv, Ukraine, and at the National Conservatoire in Tbilisi, Republic of Georgia. The Quintet presents a yearly one-week intensive Institute for Woodwind Quintets and Wind Chamber Music at New York University for high school and college students. The Quintet presented a Carnegie Hall debut recital in 1992 featuring three commissions for Quintet with orchestra. Other important concerts have included the Carnegie Hall American Music Week Series at Weill Recital Hall, the Bermuda International Festival, Chamber Music Northwest, the Inter-American Festival in Puerto Rico, the Bar Harbor Festival, the Chautauqua Festival, the Pan American Music Festivals at the Library of Congress and the O.A.S. in Washington, the Festival Internacional de Música Contemporanea in Bogotá, Colombia (1993), the First International Congress on Women in Music and two Lincoln Center Out-of-Doors Festivals.